It was like a giant field trip. Parent chaperones herded younger kids together. Giddy teenagers climbed up lamp posts to get a better look at the protesters making their way down Market Street. 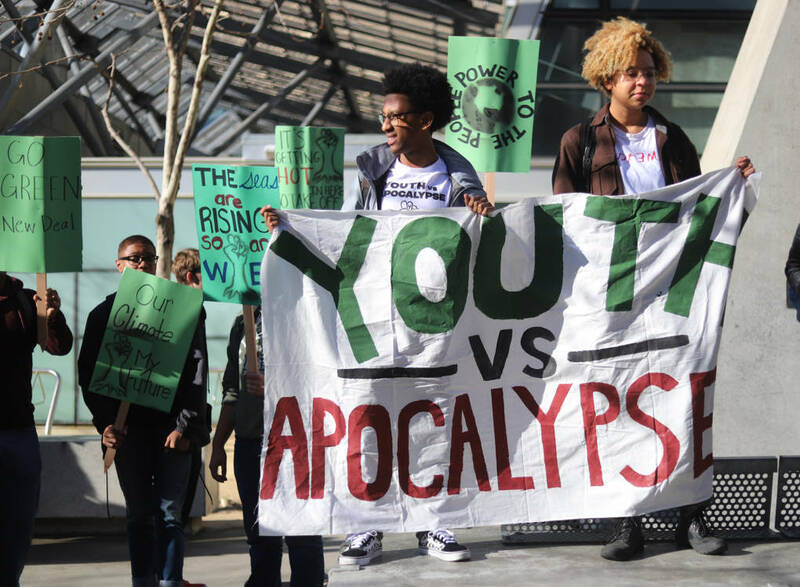 Students of all ages skipped class to send a message that action on climate change can’t wait. 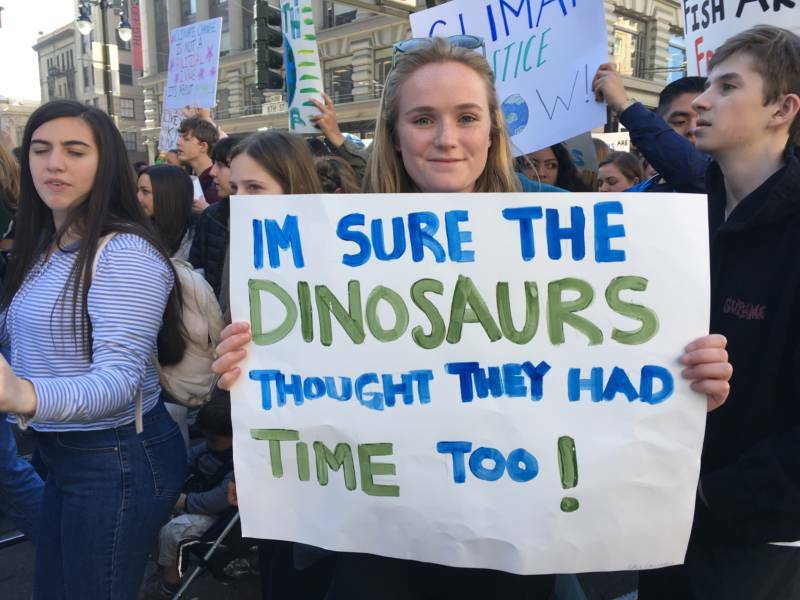 Friday's march in San Francisco was just one of hundreds of student strikes across the world that aim to hold the powerful accountable for not doing enough to slow climate change. “It is a problem and we have to deal with it now. You guys are the ones who started it and we’re the ones who are going to have to deal with it. Please, take us seriously,” said Sam Spielman, a sophomore at Berkeley High School and a member of the school’s Green Team, a student organization formed to support the economic stimulus package designed to reduce climate change, authored by Rep. Alexandria Ocasio-Cortez (D-NY) and Sen. Ed Markey (D-MA). Spielman and thousands of other teenagers and children marched about a mile from Congresswoman Nancy Pelosi's office near Civic Center to Sen. Dianne Feinstein's office in the Financial District. 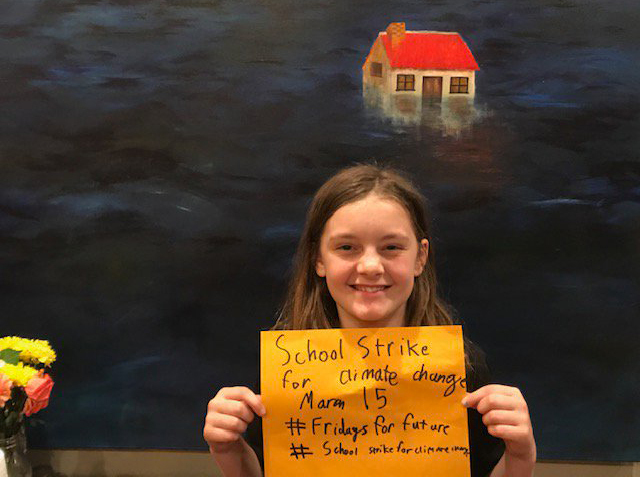 With a little help from her parents and her friends, 11-year-old Grace has made posters, handed out permission slips, and planned a two-hour walkout and march to Berkeley’s Civic Center on Friday morning. Many said they were inspired by Greta Thunberg, a 16-year-old Swedish climate activist who skipped school to protest the lack of progress in reducing reliance on fossil fuels. Second-grader Eloise Simons wore her hair in two braids, just like Thunberg. Her father, Jesse Simons, explained that her teacher at Park Day School assigned her class a presentation about someone who inspires them. Eloise chose Greta Thunberg and insisted on participating in the student strike. The students were generally on message — in an age appropriate way. High schoolers explained that they don’t know how to prepare for jobs and careers in a warmer future full of uncertainty. Middle schoolers talked about the importance of passing the Green New Deal. And elementary school students worried about storms and wildfires. Some of the children had even heard about what happened when their fellow activists visited Feinstein’s office to lobby for the Green New Deal, when the senator lectured them about her recent electoral win. A group of middle schoolers from Urban Montessori in Oakland had seen the video, and they were not impressed. The students proceeded down Market Street with a sense of urgency that only comes with youth. Teenagers counted down the years until they can register to vote. Wadbrook said she and her friends are unwilling to wait to have their say until the climate degrades beyond repair. “I’m two-and-a-half years away from voting. It feels like forever,” she said, expressing both the impatience of youth and the urgency of a veteran climate activist.